This house in the Portuguese coastal town of São Félix da Marinha comprises a series of stacked volumes clad in varying materials to signify the different programmatic functions contained within them. The property was designed by the Porto-based studio of Ventura Office Associates (VOA) to make optimal use of a plot with views towards the ocean. To provide the amount of space required while retaining the large gardens, a basement level was included to house services such as a garage, technical equipment and maintenance areas for a swimming pool. Two storeys above ground contain the main living areas, with sections of the rear facade on the upper floor protruding outwards to frame the best views from the bedrooms on this level. "The building defines an urban front and acquires height so as to take advantage of the view over the sea," said the architects. "The concentration of the programme is dematerialised by the articulation of volumes, openings, materials and textures that exalt the different natures of the programme and take advantage of the site characteristics." 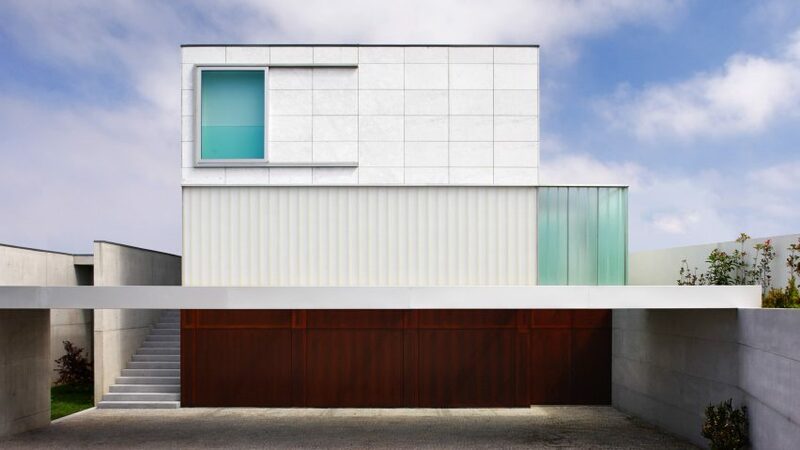 From the adjacent street, the house presents a predominantly closed facade, with the three levels clad in solid materials including richly coloured marine-grade plywood and marble panels with a subtle tone and texture. This side of the building contains service areas, circulation and courtyards, with the more private spaces tucked away along the inner side of the plot to ensure they are less affected by noise from the street. The rear facade opens onto a large patio, with sliding glass doors enabling a seamless transition between this outdoor space and the adjacent kitchen, lounge and dining area. Glazed walls enhance the sense of the rooms extending out towards the garden, as well as offering a visual connection with the adjacent annex housing the pool. The building housing the swimming pool is lined with pale stone panels and topped with a rooflight that frames views of the sky along its length. Throughout the rest of the property, white walls and glass contribute to a bright and neutral environment, with wood and stone introducing natural warmth and texture to the scheme. 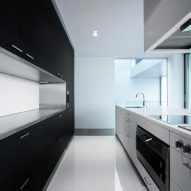 "The house combines various colour materials and components that are in harmony with each other, according to an intuitive design enriched by natural light," said the studio. Large windows allow plenty of daylight to reach the interiors, with frosted-glass panels set into the walls of spaces such as the bathrooms providing natural illumination along with privacy. Photography is by António Teixeira.